I feel this storage facility is very friendly, clean, and safe. The employees have totally went beyond expectations in helping me out with a unit and getting a uhaul to move my stuff. I highly recommend them. They were very nice and personable. They had me in and out between my job, making things fast and easy. I have rented with A Storage of Daphne previously when I first moved to Daphne and am now using them again upon moving away for a new job. I know my items are safe. The staff consistently checks that all locks are used correctly and immediately alert you if your storage isn’t locked properly. They are also very friendly and helpful. The prices are very affordable. Everything that I couldn’t bring with me for the move fit into my unit. Plus it’s A/C controlled. My experiences with A Storage of Daphne, twice so far, have been outstanding. I recommended to my mother and she stored some of our family heirlooms for a year. I wouldn’t store my personal belongings anywhere else. After visiting several storages around the area of Mobile, Spanish Fort and Daphne, I am glad I found this place. Refrigerated storage units for a FAIR deal! It was quick, staff was super friendly and the online service trully helps a lot too! I'm in the process of moving to Daphne from another country, so finding a storage that made me feel highly secure was indispensable when making my decision. Very grateful for A Storage of Daphne, I will recommend this place to everyone! We chose this facility because of the cleanliness and security, and also access at any time. The employees are very friendly, and they seem to be very organized. Great customer service! They were able to get a nice unit in a pinch! Would recommend these units to anyone. People were nice, units were clean with easy access. Great and friendly staff! Very clean storage facility! This is the best storage facility we have ever used. Great staff and superior service. Very clean with easy, secure access. We were looking for a place to store an antique car that my husband inherited. We are overall happy with the location, ease of access, and security that A Storage of Daphne provides. It is a little pricier than some other units we looked at and/or have used in the past but for the peace of mind of having a clean facility with security and friendly customer service, we were willing to pay extra. Egxcellent facility and very friendly staff. Unit was clean and ready upon rental. Great location. Easy in and out with advanced security. Clean, great price, incredibly helpful staff- they have it all. Highly recommend ! Everything was quick and efficient with easy sign up and no issues. Don't go anywhere else - this is the place! The staff here go above and beyond! Great unit. Climate controlled. Excellent security. Choose this location and you won't be disappointed! Very knowledgeable and courteous staff. Upfront about the fine print. I recommend this storage facility to anyone in Baldwin County. I love that it's close by and in a secure lot. Great location, Great staff, and Great prices! They helped me same day and even found me a discount. The facility is extremely clean with ample security features. Staff is wonderful. Second time using them for my Storage needs. Excellent facility! Clean and secure with great prices! The facility is cleaner than most I have seen, security is impressive, and the staff is very friendly and helpful! 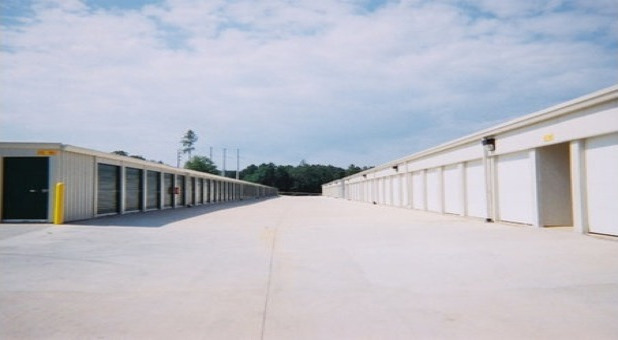 Best storage facility in Baldwin County! A Storage of Daphne has an easy to access location, friendly staff and a clean facility. It is gated and secure so that I don't have to worry about my personal items and with 24 hour access through a secure code, I can get in and out at anytime. This is the second time I've uses A Storage and I wouldn't go anywhere else! Excellent service, friendly, a pleasures to work with! Have used this storage facily before and again am well pleased. This is my second time to use this facility and am still pleased with staff and the facility. Have recommended this facility to my dtr and her husband and they to were very pleased. Thank you Walter, we are glad to have you back! I really appreciate the referral. Thank you Tara, I'm glad we were able to get everything worked out while you were on the road! Great staff & very helpful. Made for a very smooth move! Thanks for taking the time to leave a review Deborah! Very affordable, well protected, and friendly staff! The staff are great to work with. They can accommodate your every storage need. The facility appeared to be very secure and clean. Being away for the summer, this facility provided me the best place to store my college furniture while I was home over the summer. The units overall are priced very reasonably. Very impressed with this storage facility. It is convenient to where I live, clean, secured with gate and coded entrance/exit, well lit, has climate-controlled units, and staff in office very polite, helpful, and courteous. Office staff went above and beyond in sending me rental info and paperwork via email due to my not being able to get to their office during business hours. Good instructions and communication, even though it was via email. Couldn't be happier with the facility and would highly recommend it to anyone needing this type service! Thank you Jane, I'm glad we were able to accommodate your busy schedule and I appreciate you taking the time to leave a review! I'm an older woman needing a small climate control unit. Stephanie recognized my concern for safely and found me a unit close to entry. I do appreciate that consideration. Unit was clean and appropriate. Also, entry and exit is monitored quite appropriately. Thank you Theresa, we do everything we can to provide a clean, comfortable, safe environment for our tenants! Thanks for taking the time to leave us a review! A great choice to business with! Very pleased with this facility. Very professional staff, clean, and impressive lighting make this storage facility stand out. A day following my move in, I received a phone call from the staff concerned that if I may have left something out...I didn't. Beyond impressive, is that sort of professionalism by the staff there. Great piece of mind knowing this whom I'm doing business with! Best storage unit in the area. Well lit with LED lights outside for after hours so you feel safe coming and going. 24 hour access with gate entry. Clean and spacious with wide doors to move big stuff in and out. Staff is super nice. Would recommend to anyone. I would recommend this facility to any who is looking for storage. The staff is very friendly and will assist you in any way possible, Stephanie is very friendly and cares about your business. EXCELLENT ALL-AORUND, CLEANLINESS, SECURE, CUSTOMER SERVICE, PRICES, AMENITIES, ETC! Very satisfied customer, no complaints. Excellent customer service, clean facility, and very secure. I would like to thank A-1 storage Stephanie, for their AWESOME customer service..patience..staff is very friendly..also helpful with Special Rates..and great security system to protect your property..convenient location right off the interstate..I could not have asked for a better place. Thanks to Stephanie, for my 2nd time around renting their at A-1 Storage.. I just had to come back because of their great service! Yes, clean, convenient and friendly staff! Just what we were looking for! Love the location and the staff was very nice and easy to deal with. Stephanie made choosing this facility an easy decision. She helped me pick which unit would be best suited for me. I love having 24 hour access with gated keypad security. The climate controlled units are extremely clean, as well as affordably priced. It took me 3 days to pick a storage unit facility and after much research, I definitely chose the right one. Great customer service with clean and secure units. Good location, gated with keypad and security cameras. Love that it's open 24/7. Very helpful and will work with you in the office. I have used this storage facility on 2 different occasions and like the fact that these units are easily accessed and secured with gated security code access. The attendants there were friendly and courteous. I've dealt with A-storage in Daphne, AL every time I've needed storage. I love that they havelarge, easy access climate controlled units. Stephanie and Chris are very nice and extremely helpful. I would recommend them to anyone in need of storage. Great customer service, very clean and affordable prices. They also offer a free moving truck. Thumbs up!! The location is easily accessible to the Lake Forest area and very clean as well. Great customer service. Clean and great pricing. Quick and easy to lease the unit. Clean and easy access too. Excellent facility. Quick and easy to lease the unit. Clean and easy access too. Awesome storage facility. Very clean...well lighted...great security and available 24/7. Great surveillance if anything is open and the customer service is fabulous. I really appreciate the free use of the truck! I've used this company 3 times and will continue to use them. I just wanted to give an A+ for the excellent service and facilities for A Storage of Daphne. The facility is very well lighted and their storage units are very clean and adaptable. Their units are well lighted and so convenient. I totally recommend their units to everyone. Super Clean, secure, and a friendly staff. Highly recommended!! The facility is very clean. I was able to get a unit quickly. The facility is very secure. Great customer service. I am very happy with my experience. Well maintained facility and excellent staff. Definitely a plus for your storage needs. Clean, sturdy, and affordable. Very nice place. Excellent service. Thank you Saphia! I'm glad we were able to help you. Staff was very helpful and everything went smoothly! Stephanie at the desk was very helpful! Facilities is gated and very clean! Helpful staff, clean units, competitive price, and truck rental a plus. Very convienent location....just down the road from our house. The staff did a great job answering all of our many questions about cost and size. Chris. Good location, easy access, reasonable rates. The staff is friendly and helpful. The facilities are clean and prices are great with excellent features. Thanks! Excellant customer service, friendly staff, and a very clean facility. A Storage gets an 'A' from me! I have nothing but good things to say about A-Storage of Daphne. We are now in our second stint of using the storage facility, and Stephanie has again made our experience not only painless but also pleasant. The units are nice and easy to get into, and we never have experienced a problem with access at weird hours or shady people making us uncomfortable. Keep up the good work!!! We would definitely recommend this facility to others. Thank you A Storage of Daphne, you made my recent move easy and convenient I appreciate the friendly staff and the free truck rental. I will recommend you to anyone who needs a storage! The units themselves are nice and the facility is clean. However, I would never recommend A Storage of Daphne to anyone. Simply because a staff member, (a woman, didn't catch her name) was extremely rude and made unnecessary remarks to me about my personal life while I was trying to take care of a payment. I picked up that she was judging me based off of my appearance. Her attitude towards me was completely unprofessional. For me, attitude can make or break a business, and that is precisely what she accomplished in the short time I was there. This is why I regretfully have to give one lonely star. First of all, thank you for voicing your recent concerns regarding your tenancy at A Storage of Daphne. We appreciate your feedback, and will use what we have learned in an effort to improve our business standards in the future. The care and satisfaction our customers receive is held in the highest regard by our employees and owners. If you could please contact our office with your contact information so we will be able to contact you regarding this situation. You can also contact us via email through the contact us section on the website. Recently my family had to relocate to another state and I had very little time to locate a storage unit for our furnishings. After researching several local units none of them came close to the customer service, cleanliness and price that A Storage of Daphne had to offer. The unit that I leased is super clean and the staff were very helpful in understanding the tight time frame. Thank you A Storage of Daphne!!!! Clean well lighted facility. Delightful staff. Convenient location. Great security. Just make sure to pay on time to avoid fees. I would recoomend this storage unit to anybody! The facility is always neat and the staff is very friendly and helpful! A Storage of Daphne is a clean, safe facility with great business services. They even sign for shipments and place them in my unit. Any small business looking for storage should come here! Great location, clean, and friendly staff. Good rates. This is the most difficult website payment method I have used. It always takes several attempts before it works. After payment info is put in the needs to be a continue button. The method you have doesn't make sense. I have used this facility a couple of times in the past and the service and cleanliness of the facility is always top notch. Also, the staff is very accommodating and friendly. I would recommend it always to anyone who asks where a good place is. I feel that they go above and beyond to keep the customer happy. A Storage of Daphne has been a great service for our family over the last four years. We have stored furniture and items as we moved to a new town, lived in a smaller home, took in my terminal sister and stored her & her four children's items, store Christmas presents every year (the kids NEVER find them!! ), and kept our garage free and clear to set up a ping pong table and weight bench for all the kids. In addition to providing a safe, clean, climate-controlled storage unit, A Storage always gives us prompt and friendly customer service. Stephanie calls to check on us if I forget to get my payment in right on the first of the month. I appreciate her courtesy calls and her helpfulness as we upgraded to a larger unit due to taking in my dying sister and her four children. I was thankful for her kindness during a difficult time. It's the little things that make a difference. This is a great storage facility! Stephanie in the office is wonderful. Very helpful and accommodating. She even contacted me to let me know that I forgot to properly lock my unit. I had no idea that they do weekly run throughs to ensure that everything is properly locked. The place that used before only cared about getting our money but here, I really feel like they care about us as clients. The grounds are clean and well maintained. I would recommend this storage facility to anyone who is looking. Well worth the money! Love this storage facility. It is so easy to enter and exit and it is always clean and well maintained. I highly recommend them to everyone! I also love the easy rental and payment kiosk! We have been very pleased with our storage rental unit. The facility is clean and well managed, and the security system is great. I also like the climate controlled unit with external access.I would highly recommend this facility to anyone looking for a storage solution !! I am a long term renter (for work). The staff is ALWAYS accommodating and easy to work with! They are helpful and the grounds are always clean!! The unit was very clean and the people are very friendly and helpful. We had moved down around a year ago from Syracuse N.Y.and looked at several self storage units,after a few days of looking we came across A- storage of Daphne. It was very clean and safe looking just what we where looking for, price wise and size, climate controlled.the employees are very friendly and courteous. We had gone there one day and locked the lock but did not put the bar all the way through that night we got a all from the A- Storage letting us know that it was not locked properly. They have 24 hr service which is a nice. I would recommend A- Storage of Daphne to all I meet. Thank you A - Storage of Daphne Alabama for having a very Clean and safe storage unit for the people that have and are going to get a unit from you. I have had this storage unit for well over two years now and it has been a blessing. Friendly, courteous staff and ease of access. Would highly recommend to anyone! Excellent so far. I have even taken an interest in they storage auction ing process as a business start up! Quite impressive. I Have recommended your facility already! Great Place! Clean! Reasonably Priced! Friendly, convenient, etc - Thanks!